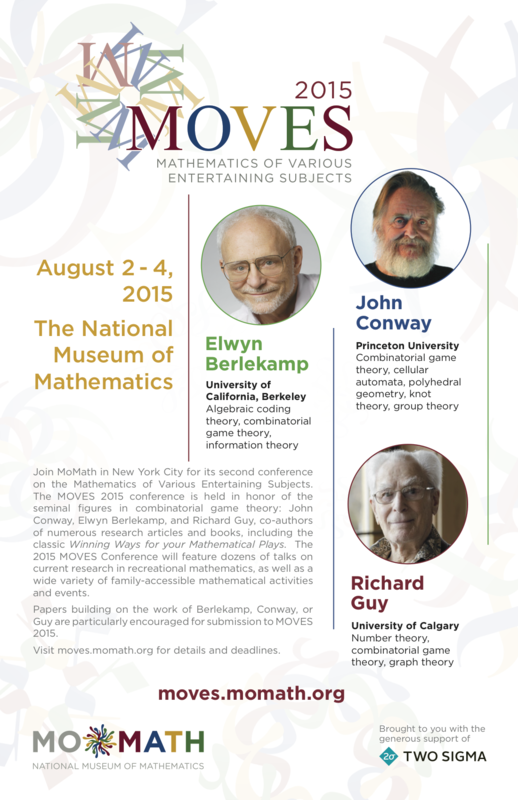 The National Museum of Mathematics held its second-ever conference on recreational mathematics from August 2-4, 2015. MOVES 2015 attracted over 271 attendees from 24 different states and 12 different countries. Conference highlights included a dessert reception and open house; a book signing and meet-n-greet with honoree John Conway and his biographer Siobhan Roberts; a special night of mathematical performances; two days of sessions on the mathematics of games, puzzles, and sports; and a special track of guided mathematical activities for the whole family. 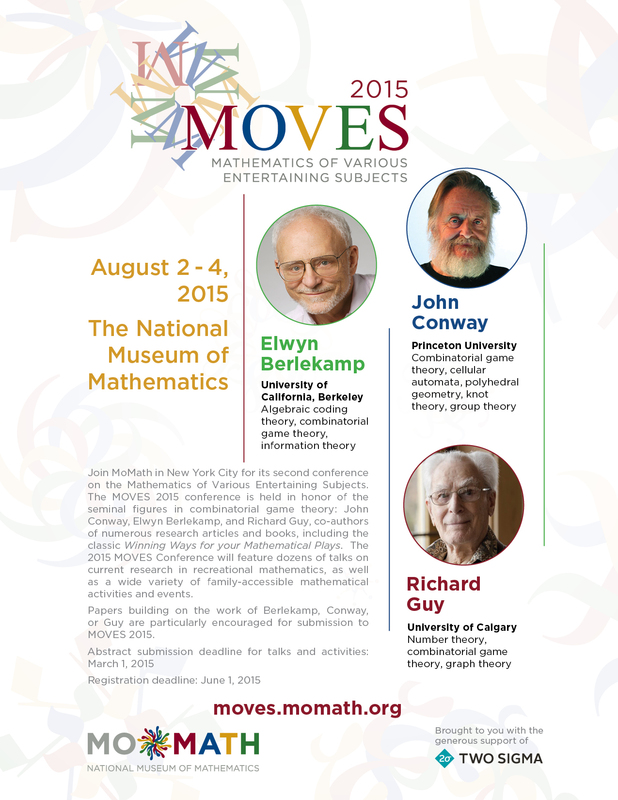 Download the MOVES announcement poster. View the official conference program. View the MOVES 2015 abstracts for the research talks and family activities. To add your name to the MOVES Conference mailing/announcement list, click here. The 2015 MOVES conference welcomed guests from 12 different countries including Australia, the Czech Republic, Germany, Japan, Mexico, The Netherlands, Norway, Portugal, South Africa, the United Kingdom, and the United States. There were 117 total cities and 24 US states represented. The cities with the most attendees were New York, NY, Brooklyn, NY, and Easton, PA. The countries with the most attendees were the United States, Japan, and Canada. The longest distance guests traveled was 9,643 miles from Paddington, Australia. Guests also traveled 8,138 miles from Wakkerstroom, South Africa, and 6,896 miles from Hirakata, Japan. Take a look at MOVES 2013 here.